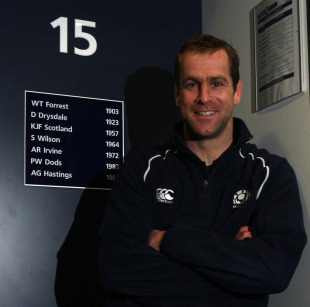 Murrayfield will be given the chance to bid farewell to one of their favourite sons when Chris Paterson presents the match ball at the Calcutta Cup clash between Scotland and England on February 4. The 33-year-old Edinburgh fullback announced his retirement in December after 12 years as a Scotland international which included record hauls of 109 caps and 809 points. Paterson's final appearance for Scotland was in October's Rugby World Cup loss to England in Auckland and now he will be given an opportunity to say his international goodbyes at the stadium where he made his debut in 1999 ahead of the Six Nations opener on February 4. Paterson said: "I've always treasured the support I've had throughout my career. "I've spoken about getting goosebumps with some of the cheers I've had at Murrayfield and the response I've had from Scotland fans since I announced my retirement has been almost overwhelming. "I'll be at Murrayfield for the Calcutta Cup game, firstly as a Scotland supporter, and secondly to say thanks."